A mysterious fireball made a dramatic entrance into the Scottish sky, lighting up the night and making a loud rumbling noise, which left residents somewhat confused. The object is believed to have been a meteor, though that has yet to be confirmed. Police in Scotland said they received a flood of calls at around 6:55pm on Monday, after a bright flash was seen dancing across the sky, Mail Online reported. Residents said they spotted blue, white, and green lights, with many saying they heard a rumbling sound. 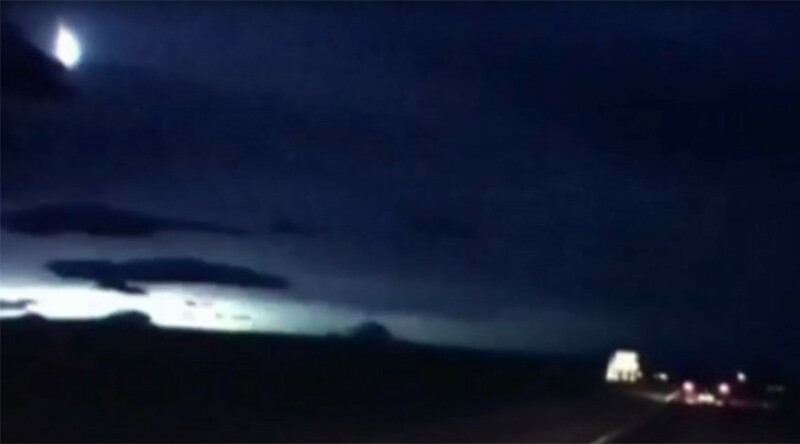 The fireball was filmed by several dashcams, with drivers posting the footage online. Police and astronomers said the fireball was likely to be a meteor, which burned up as it entered Earth's upper atmosphere. However, that speculation has yet to be confirmed. The Met Office ruled out the possibility of a weather-related cause, stating that there were no thunder storms over Scotland on Monday night. The unexpected fireball shocked those who witnessed it. Resident Jenni Morrison summed it up with a shout of: “What the hell was that?” in dashcam footage as her car drove underneath the flashing light. Others took to Twitter to express their amazement. This 'meteor' in Scotland had better not have been the work of aliens. Imagine the fight over "Take me to your leader..."
There were suggestions that the alleged meteor could have been a sonic boom from an aircraft or a flare from a satellite. However, there were no reports of an aircraft in distress and the British Ministry of Defence (MoD) said it was unaware of any events in the area, Mail Online reported. The mysterious fireball comes two years after a meteor exploded over Chelyabinsk, Russia, causing damage within an 80-kilometer (50-mile) radius. The meteor was found to be 30 times brighter than the sun, with a force of 40 Hiroshima atomic bombs. Scientists concluded the meteor was the biggest in a century.